Play Keno in the online casino! Keno is a popular game in casinos around the globe, online and off. It is a lottery or bingo like game with simple rules in which players guess which numbers will be drawn at random and get paid based on how many numbers they guess correctly. If you have never played Keno before the good news is that the rules are incredibly simple to learn. Once all players have marked off their Keno cards the drawing occurs. In most live casinos the Keno numbers are listed on ping pong-like balls that are placed in a glass case and drawn at random. When you play Keno on the Internet numbers are drawn at random using random number generator software. 20 random numbers, between 1 and 80, are drawn in each drawing. Once the balls are drawn all of the submitted Keno cards are checked and winners are determined. Players are paid out based on the pay table at the casino where they are playing. Keno is a game of chance so there is no real strategy to playing. You may come up with a system for selecting your numbers etc, but the numbers are all chose randomly. So it is hard to know if a number will come up or not, even if you haven't seen a particular number for several games doesn't mean it will come up. The same number may also be selected repeatedly there is no real logic that can be applied to increase your odds of winning. Some players like to chose half of their numbers low and half of their selection higher numbers, sometimes this works but the numbers are all randomly selected so it is more chance than method. 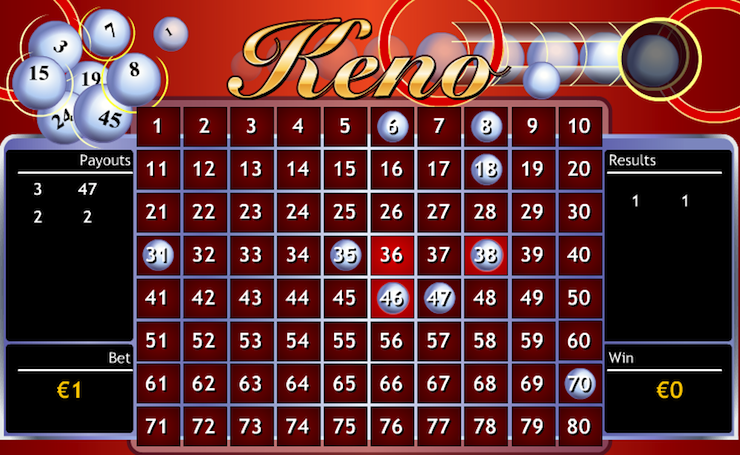 Keno is a fun game to play and should be just that, a game for entertainment an wager.